When I started reading this book, I really wasn't sure if it was for me. I started to steal ten minutes with it here and there for a while, until I got to about page 50 and then I no longer had trouble with picking up the book, the trouble was with putting it down. Set in Australia, in what is the biggest drought the country has seen in many many years, the rural town of Kiewarra has bigger problems to face then the drought. After fleeing the town two decades earlier with his father, after being accused of murdering his friend and girlfriend at the time, Policeman, Aaron Fauk makes a return to the town to attend the funeral of his one best friend, Luke Hadler. Hadler is accused of murdering both his wife Karen and their six year old son Billy, before turning the gun in himself. The only surviving member of the Hadler family is Luke and Karen's thirteen month old daughter, Charlotte, who has now been placed in the care of Luke's mother and father. But there is a reason that Fauk hasn't returned to his hometown before now, as many of its residents are certain that he murdered Ellie Deacon twenty years ago and are setting out to ensure that he knows he is no longer in the town. After seeing how the accusations made against his childhood friend is affecting the family members that he has left behind, Fauk finds himself opening an investigation into what happened to the Hadler family and more importantly, who. But in the midst of this investigation, Fauk may just find the answers he has waited twenty years to hear in relation to the death of Ellie Deacon. After finishing this book, it is very easy to see how the film rights have already been sold. The Dry was written to be adapted into a film and, in my opinion, has all the right ingredients to make it a huge blockbuster. 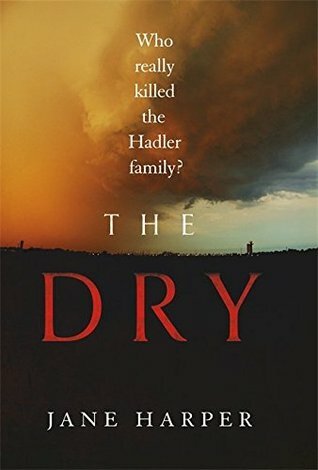 The suspense in The Dry is second to none, and I have never read a book that has had me on the edge of my seat like this one has. Jane Harper keeps the story moving at a brilliant pace and keeps the suspense up, only to break it down again, when you realise that the story is moving in a completely different direction that the one you thought it was going to take. There was many shocks for me when it came to reading this book, but the biggest shock was not contained within the story or the pages. 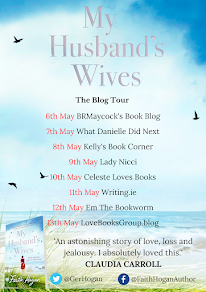 The biggest shock for me is that this book is Jane Harper's debut novel, because the style of the writing is what you would expect from someone who has been dishing out a novel a year for a couple of decades. I am so looking forward to seeing what else Jane Harper has up her sleeve, when it comes to future books. 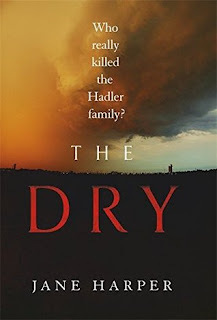 The Dry is a harrowing story, that is full to the brim of twists and turns and that keeps the reader thoroughly entertained and on the edge of their seat. I had this novel devoured in a few short hours and I am finding it nearly impossible to find the words to do this book justice. The characters all seems so real and I felt as if I was watching this on a documentary rather than reading a work of fiction, they were all so very well developed. The setting for the story is very unique and spellbinding. While this book could be set anywhere at all in the world, the fact that it is set in Australia in the height of a drought adds to the suspense of the story. I can not recommend this book enough. It's my second read of the year, but is definitely a front runner for my book of 2017.